Should Hailey host more than 1 rodeo? 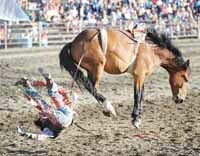 A cowboy takes a tumble from the back of a bucking bronco during the 2010 Days of the Old West Rodeo in Hailey. Now that the historic Hailey rodeo arena has been razed, giving way to a new "multi-use arena" at the south end of town, Hailey officials are pondering who will be allowed to use the facility and when. Hailey Parks & Lands Board spokeswoman Becki Keefer asked the Hailey City Council on Monday, Nov. 22, to formalize a "gentleman's agreement" and give the Sawtooth Rangers an indefinite lease for the Fourth of July weekend. She also asked that the city not allow any other rodeo to take place at the arena during the year, so as not to compete with the Rangers' annual Days of the Old West Rodeo every July. The council rejected both recommendations and decided to hold a public workshop later this winter to establish rental policies for use of the new facility, being constructed with a $3.5 million public bond issue and private donations. Councilman Fritz Haemmerle said the Sawtooth Rangers made money from the arena for many years and "did not put much back into it (the arena)." "The citizens of Hailey rescued this rodeo," Haemmerle said. "It cost $3.5 million." Councilwoman Martha Burke agreed with Haemmerle that the Sawtooth Rangers should disclose what they make on the rodeo each year and that the city should keep the door open for a larger professional rodeo that could bring more revenue to the city. "I would like to see the Sawtooth Rangers' business plan," Burke said. The nonprofit Sawtooth Rangers riding club, which built the old arena in 1947, has leased the city-owned property for $1 per year for decades. A core group of 12 members organize the rodeo each summer and is joined by another 40-50 volunteers during the event. The Sawtooth Rangers have long had authority over what goes on at the arena at other times of the year, but that will soon change, as the city is hoping to attract farmers markets, concerts and other events to the new facility. "It's the city's property so they will have control over that," said Sawtooth Rangers President Bill Bobbitt in an interview. "I can understand wanting to keep it open to other rodeos because there is a pretty big investment there." However, he said he would like the Sawtooth Rangers to have authority over which rodeos take place at the arena at any time. "We have shown a dedication to the community to support the rodeo all these years," he said. "If somebody else wanted to do a rodeo, we would like to be asked first. We also would like to reserve two or three other weekends during the year to do horse shows and other events." The Sawtooth Rangers produce an Intermountain Professional Rodeo Association rodeo each summer, relying on local sponsors for support. Bobbitt said the rodeo makes $5,000 to $10,000 after paying stock contractors. He said it keeps just enough money to cover the next year's expenses and gives the rest of the money to high school rodeos and other causes. "We tried to put on a Professional Rodeo Association rodeo for a few years and we lost money," he said. Bobbitt said the group also tried to do a Labor Day rodeo but that didn't work out either. The council agreed to meet with Parks & Lands Board members individually during the next few weeks in preparation for a public workshop to establish rental policies with the Sawtooth Rangers and other organizations. The date of the workshop has not been determined.